The United States claimed their first Ryder Cup triumph since 1999 with a crushing 16½-11½ victory over Europe. Leading 9-7 going into Sunday's singles, Paul Azinger's men reached the 14½ points they needed for victory when Jim Furyk beat Miguel Angel Jimenez. It put the contest beyond doubt with four matches left out on the course. Anthony Kim thrashed Sergio Garcia in the first match to set the tone for the day and the home side ended up winning seven of the 12 singles matches. Kenny Perry, Boo Weekley, JB Holmes, Ben Curtis and Chad Campbell were the other American victors, while debutant Hunter Mahan halved with Paul Casey. The only bright spots for Europe were the wins for Robert Karlsson, Justin Rose, debutant Graeme McDowell and impressive wildcard pick Ian Poulter, who justified his selection by ending up as the event's leading scorer with four points from five matches. The defeat is Europe's worst performance since Walton Heath in 1981, when they were thrashed 18½-9½. 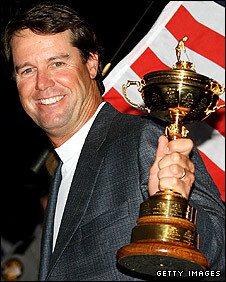 "It was amazing - the golf was spectacular on both sides and our guys came out on top," said Azinger. "I'm just emotional. We had a plan and stuck to it." Europe had been strong favourites going into the event after winning the last three Cups and five of the last six. The United States, meanwhile, were without injured world number one Tiger Woods as well as having a total of six debutants in their 12-man team. 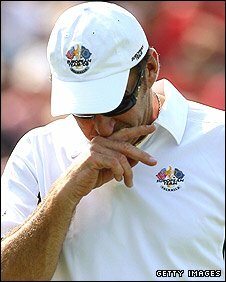 And Azinger, who changed the qualifying system to have four wildcard picks instead of two, then delayed his final selection to give the contenders more time to play their way into form. But despite their underdog status, the United States, backed by a vociferous crowd, produced a superb team performance and they never looked back after leading from the first match of the first session on Friday. European skipper Nick Faldo had seen his side reduce Friday's three-point deficit to two after a rallying performance on Saturday and he decided to select a bold line-up for the Sunday singles. But the gamble of leaving in-form Poulter, world number 12 Lee Westwood, and three-time major winner Padraig Harrington until the final three pairings backfired as the contest had already been decided before they had finished. "We had it planned that if we could just get it through to last four," said Faldo. "That was the risk we took and we have literally come out one guy short. 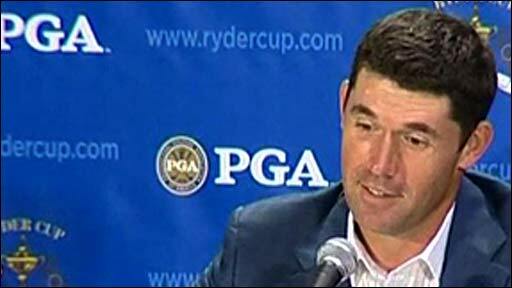 "Padraig wanted it that way, if we could have got into the last four. You miss out by one match - we are divided by fractions. "I've got to be proud of everyone. There were 24 guys giving their all and we just came up short. The United States have done us and congratulations to them." The European cause was not helped by the poor displays of their big names with Garcia, Westwood, Harrington and wildcard Casey failing to win a match all week. Faldo had sent Spaniard Garcia out first in a bid to get the scoreboard moving in Europe's favour, but that did not work as fired-up rookie Kim delivered a crucial blow for his side, winning a spiky match 5&4. With the US three points ahead, Europe needed to get going and they briefly rallied with Karlsson and then Rose claiming victories. Karlsson of Sweden played superbly against Justin Leonard and was never behind, carding four birdies in a flawless 15 holes as he secured a 5&3 triumph. Rose was always in control against subdued world number two Phil Mickelson, sealing a 3&2 victory with an 18ft birdie putt at the same hole. Casey then dug in to halve a hard-fought half against Mahan at the last despite being behind for most of the contest. But then the Americans went on a decisive roll and Azinger's middle-order delivered the Ryder Cup by winning the next four matches. Kentuckian Perry delivered a popular win for the home support, firing seven birdies and an eagle to defeat Swede Henrik Stenson 3&2. Then the entertaining Weekley, who started the round by skipping down the first fairway riding his club as if it was a horse, produced a fine display and was eight under through 16 as he recorded a 4&2 win over Oliver Wilson. With plenty of red on the board in the closing matches, Dane Soren Hansen's match with Holmes took on massive importance but when the big-hitting American secured a 2&1 win, the home side were just one point away from glory. And it fell to Furyk, who watched as Paul McGinley made the par putt that clinched victory for Europe at the Belfry in 2002, to claim the trophy as he recorded a 2&1 victory over Spain's Miguel Angel Jimenez. With the celebrations starting around the 17th green, the focus understandably drifted away from the four matches left on the course but the players still had to complete their matches as protocol dictates. Poulter, whose selection ahead of Ryder Cup veterans Darren Clarke and Colin Montgomerie caused plenty of controversy before the matches, proved his critics wrong by recording a 3&2 win over Steve Stricker. McDowell defeated Stewart Cink 2&1 to register a haul of 2½ points from four matches in his maiden Ryder Cup but 2003 Open champion Curtis and then Campbell completed the rout with victories over Westwood and Harrington. 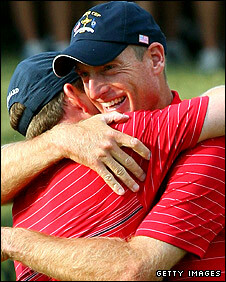 The United States will defend the trophy at Celtic Manor, Wales in 2010.